A trip to Greece is on the top of everyone’s must-see locations. While Greece can be done in less time, I think Greece deserves two weeks of someone’s time. If you have already done the mainland, you could probably do the main islands (i.e., Mykonos, Santorini, and Crete) in a little over a week. If you are going to Greece, the odds are that you are flying into Athens. 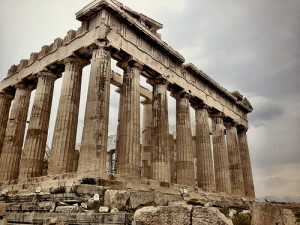 From my research on Athens, Athens is worth 3 days / 2 nights given all of the other attractions in Greece. You should easily be able to hit all of these locations and get a taste of the Greek culture in the 3 day / 2 night allotment. Before heading to Meteora, many people will make a slight detour (only adds 1 hour to the journey) and stop at Delphi to see the Delphi ruins. The most famous ruins are the Temple of Apollo. Delphi is located about 2.5 hours from Athens. My recommendation would be spend half day in Delphi and then continue drive to Meteora to see the sunset, which is supposedly amazing. While Meteora may not sound as familiar as Santorini or Athens, many people will recognize Meteora from the pictures. Does this look familiar? Meteora is a little over 3 hours from Delphi or 4 hours from Athens driving in a car. If you are taking a bus (KTEL bus from the terminal on Liossion Street), it might be closer to 5 hours from Athens. You also have the option to do an OSE train (#884) from Larissa Station to Meteora. 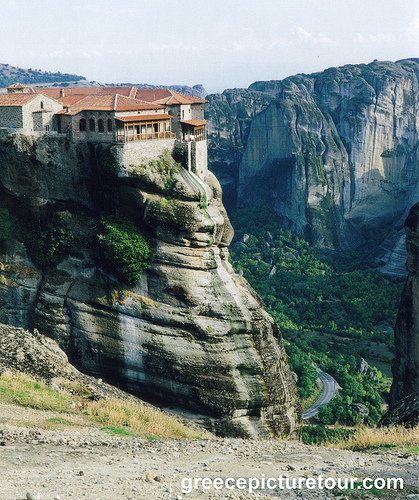 In Meteora, most of the monasteries were built in the 1500’s. With that said, there are about half dozen that should be visited. Each monastery requires a 2 euro fee and proper dress is required. Women must wear skirts below the knees, but some of the monasteries will provide women with shorts or slacks. Men must cover their arms and wear long pants. One other valuable piece of information is that the monasteries are closed between 1 and 3 each day. This is when it would be best to grab lunch. At your hotel, you should see when the different monasteries are open. 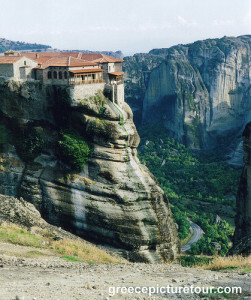 When staying in Meteora, most people stay in Kalambaka and Kastraki. Kastraki appears to be the best choice of the two locations as it is the closest. You can stay in Kalambaka fairly easily if you have your own car. You can easily hike the monasteries by yourself, but you most likely want a guide if you want to learn a lot about the different monasteries. Reading from guide book won’t do justice if you are a history buff. The primary monasteries can basically be broken into two circuits, East and West circuits. If you are in a rush (like I am), then I would do both circuits in one day. If you have time, you can probably split it over two days to go at a slower pace. You also need to understand that tour buses will come in droves so come in early especially at the top monasteries. The most popular monastery is Grand Meteoron and should likely be your first stop. You can also come at the end of day to watch the sunset and most of the tour groups should be gone by then unless they are on a sunset tour. There are parking lots at all of the monasteries. With the possible exception of Mount Olympus, I would not put Mount Athos and Vikos Gorge as must see locations. Mount Olympus is the home of the Olympian gods and goddesses as it is known in Greek mythology. The highest peak on Olympus is the Mytikas peak at 2,917 meters (9,570 feet). This is also the highest spot in all of Greece. ~10,000 people hike up Mount Olympus each year. Mount Olympus is about 2 hours east from Meteora in Olympus National Park. You will be traveling to Litochoro. You can get to this town by train (www.ose.gr) and/or bus (www.ktel.org) from Athens and Thessaloniki. You also have the luxury of driving to the park. You can hike the park by yourself without a guide. No technical expertise is needed. You can realistically reach the summit from April to September with the best month being in August. If you go to early in the season, it may be difficult hiking in the snow. If you start early in the morning and are in good shape, you should be able to hike the mountain in one day. If you don’t want to be in a rush and want a more relaxed state, you can hike it in two days. There are refuges on the mountain where you can stay. If you are hiking in July/August, you likely need to make a reservation in advance. Many people from the summit will also hike along the ridge to Skolio (second highest peak in Greece) as well. The view from Skolio of Mytikas and the other peaks is supposedly amazing from this vantage point. The trails are clearly marked and there is no fear of getting lost. Some people recommend continue hiking on the E4 path through the Enipeas valley. This is one of the most (if not the most beautiful part of the hike) beautiful parts of the hike. Depending on whether you hike the mountain in 1 or 2 days will likely dictate whether this is feasible. Depending on the amount of time that you have available, you should try and do this hike. Vilkos Gorge is 2.5 hours from Meteora or 3.5 hours from Mount Olympus. It is the second largest gorge in the world. If you only have two weeks in Greece, the odds are that this will not be part of your itinerary. I would only visit here if you have time permitting. If I had one extra day, I would visit Mount Olympus before visiting Vikos Gorge. The gorge has two main channels. Most people will start in Monodendri and walk towards Vikos. This will take 6 to 8 hours. You will need to try and find a way back to the start. There are limited public transportation options. You should do some more research if you plan to go the Vikos Gorge. Mount Athos is an autonomous state under Greek sovereignty. 1,400 monks live in 20 Eastern Orthodox monasteries. While it might seem like a fun idea to go to Mount Athos, access to the peninsula is strictly controlled. They only allow 110 people to visit per day with 100 of them being Orthodox and 10 being non-Orthodox. You have to go through a complex process to get access to Mount Athos. By the way if you are female, you won’t be allowed to go to Mount Athos. Unless you are deeply religious, it probably is not worth all the effort to reach Mount Athos. Mount Athos is about four hours from Meteora. There are anywhere from 1,200 to 6,000 Greek islands. Depending on the type of trip that you are looking to take will largely dictate what Greek islands that you want to visit. Mykonos and Santorini have beautiful architecture and active nightlife. Crete has a wide diversity of landscapes including the famous –Samaria Gorge. Rhodes also has a special place in many people’s hearts. Mykonos is part of the Cyclade islands. It is also one of the most popular islands. It has a lively night life and lots of beautiful beaches. It is also one of the most gay friendly islands. Little Venice is also popular location in Greece. You should definitely make a point of watching the sunset near the iconic windmills or in Little Venice. Outside of beaches and nightlife, there doesn’t appear to be anything that is a must see. By ferry, it can take anywhere from 3.5 hours to 5.25 hours depending if you taking a high speed ferry or a regular ferry. From my research, I think 3 days/2nights is probably enough for Mykonos. I think this is the proper amount of time if you want an active nightlife. If you aren’t looking for an active nightlife, you may want to skip Mykonos. Santorini is a volcanic island located in the Cyclades. 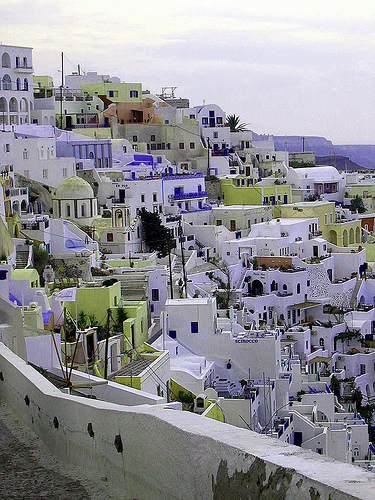 Santorini is known for its architecture and famous beaches. Oia is one of the most popular towns in Santorini. It is beautiful with its iconic white buildings. Fira is also a popular town. Santorini is probably worth 3 days / 2 nights. You can take a high speed ferry from Mykonos to Santorini in about 3 hours for about 30 to 40 euro. You might also be able to get cheap tickets aboard Aegean Air. Crete is the largest of the Greek islands at 260 km long and 60 km wide. Across the island, there are a variety of different landscapes from mountains to beaches to lush fields. One of the main attractions in Crete is visiting the Samaria National Park. In the National Park, the highlight is the Samaria Gorge. It will take 5 to 7 hours to hike the gorge. You can also visit the most famous archaeological site on the island known as Knossos. 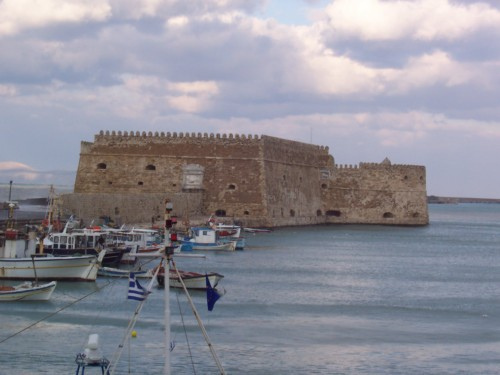 There also a number of different archaeological sites on the island that can be visited. In Crete, there are also over 3,000 caves and a number of monasteries. You also have the opportunity to see a number of beaches. I would recommend spending 3 days / 2 nights on the island. Rhodes is another one of the popular islands. Castle of Monolithos is one of the more popular Greek islands. The majority of Rhodes beaches are gravel and not sand, but it does have more than 300+ sun days. You also have the opportunity to climb Mt. Attavyros (1,215 meters) over a 2 to 3 hour period. Of these different islands, I think Corfu and Zakynthos look like the most attractive. I would even think of visiting one of them instead of Rhodes or Mykonos if I wasn’t into partying.